I have a jealousy problem… I hate to admit it, but I’m often jealous of other people’s produce. Yes, you read that correctly. Produce. But wait, I had some rhubarb in the freezer from last year. But that posed another problem. It was rhubarb alright, but not the pretty pink stuff. It was the green with a hint of red stuff… not exactly the “glamorous” variety. So let’s get this straight, I’m now jealous of the *color* of the rhubarb. Oh brother, right? Well, I finally got over it and pulled the green rhubarb out of the freezer and started an infusion. And because of my insecurities about the color and variety, I spiced it up with some orange zest, orange liqueur, and brown sugar. A few days later, I ventured up to my parents farm (my favorite source for organic produce). To my surprise, the beautiful red rhubarb was flourishing. So I came home with a bunch of it and started another infusion. They are both delicious. I think so far most people prefer the Rhubarb-Orange, but they are both tasty, and will be perfect drinking alone and in cocktails. 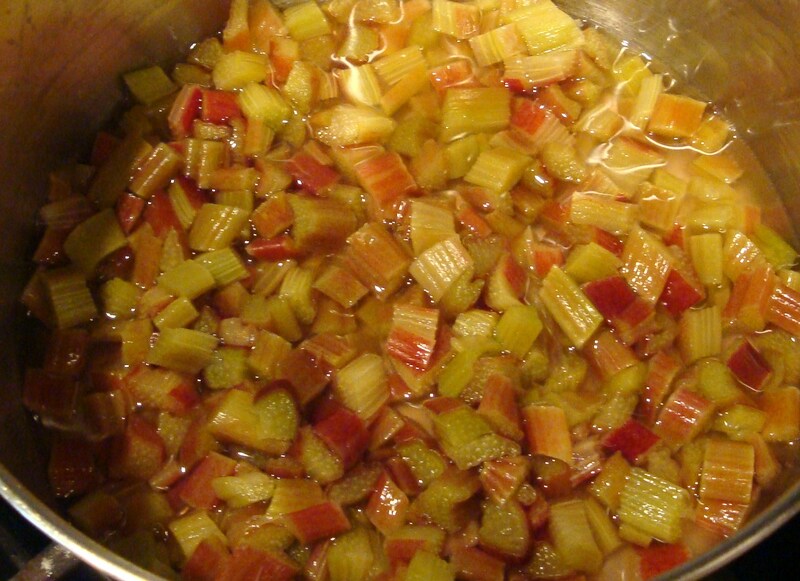 In a small saucepan, combine rhubarb and Orange Liqueur. Heat until it starts to simmer. Allow to simmer on low for about 2 minutes. Set rhubarb aside and allow to cool. Once this has cooled, add all ingredients to a quart jar (or larger). Close the jar, shake, and place in a dark, cool location for about 4-5 weeks. Strain with a mesh strainer, press through cheesecloth, then a jelly bag and finally coffee filters. Perfect! 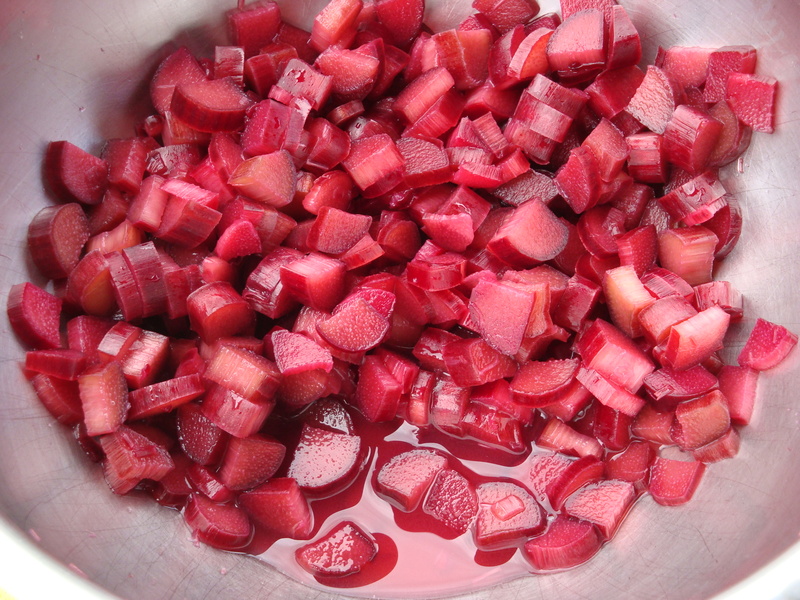 Toss rhubarb and sugar in a bowl and allow to macerate for at least an hour. (I followed the advice of Country Girl Brooklyn on this step) This brings out a lot of the beautiful pink juices from the rhubarb. Place the macerated rhubarb and juices in a canning jar with the gin and allow to infuse for about a month. Strain and filter with a mesh strainer, jelly bag if desired, and coffee filters. Once it is filtered, add simple syrup to your desired taste. While these were infusing, the Rhubarb-Orange definitely looked pretty undesirable. The red rhubarb almost immediately became such a beautiful pink. But now that they are filtered, I realize that I should not have judged a rhubarb by its color. I was discriminating. I’m sorry rhubarb. Please forgive me. 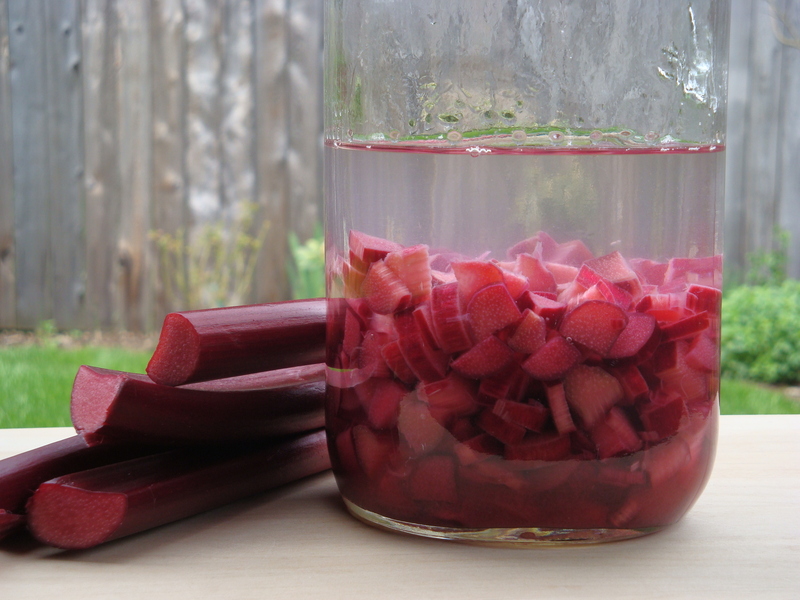 If you haven’t already made a rhubarb infusion this year, you should try this! I understand that some areas may not have fresh rhubarb any longer. But in my area we can usually keep harvesting through August. If it’s too late, then please try this next year. They are both very tangy and tasty. They actually both look quite beautiful now too, don’t they? 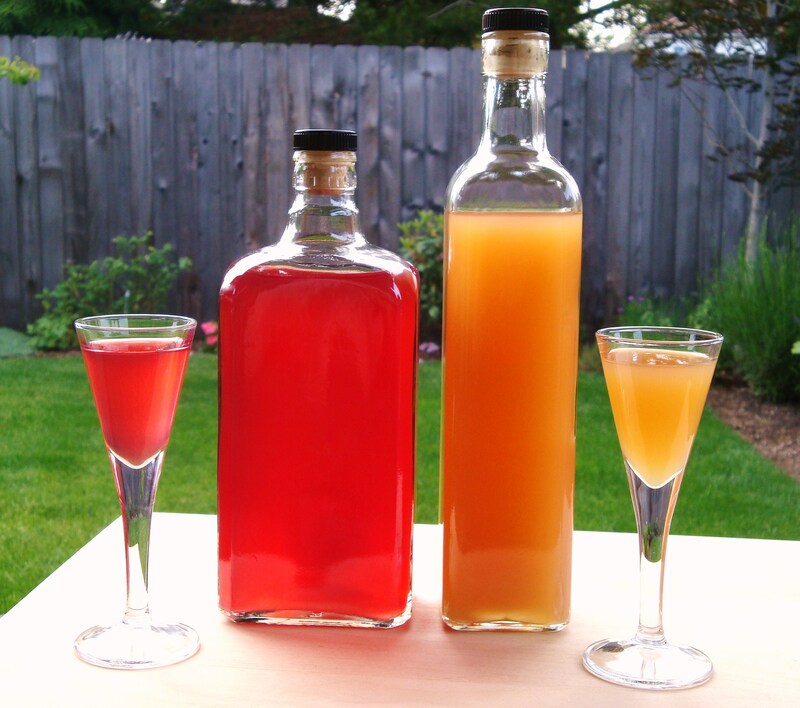 Categories: Infusion, Liqueur, Recipes | Tags: gin, infusion, Liqueur, orange, rhubarb | Permalink. beautiful colors and photos ~ i love the idea of rhubarb with grand marnier! Thanks! I made a rhubarb-orange jam a few years ago and fell in love with the flavor combination. Now I wish I hadn’t made so many rhubarb desserts! I should be able to salvage a coupe cups, though. I’m on the rhubarb-orange one. I love the flavor of rhubarb, hate the texture. This solves the problem. Yum! I love rhubarb so much…definitely have to give this one a try! Alicia, I hear yah! I get jealous when I read about people who have Meyer lemons and avocados growing in their backyard…cold Calgary does not have that, though it produces great rhubarb and now I am going to try and produce some great rhubarb gin, thanks to your post! Ha! I’m totally jealous of all the rhubarb going around too–CA has practically everything else (ok, except fiddleheads and ramps) but there’s definitely no rhubarb at our farmer’s market. I may have to venture into an actual grocery store, though, because that rhubarb-orange combination sounds SO good. Yes, the rhubarb-orange flavors go well together. Hope you get to try it! The infusions with rhubarb are a great idea, we use rhubarb bitters but the flavor can still get lost. Thanks! The colors turned out so pretty. I had tried a rhubarb liqueur at a restaurant that was too sweet, and not enough rhubarb flavor, so I think we solved the problem here. Especially with the straight rhubarb gin. I love bitters, but you are right. Some flavors have a hard time shining through. 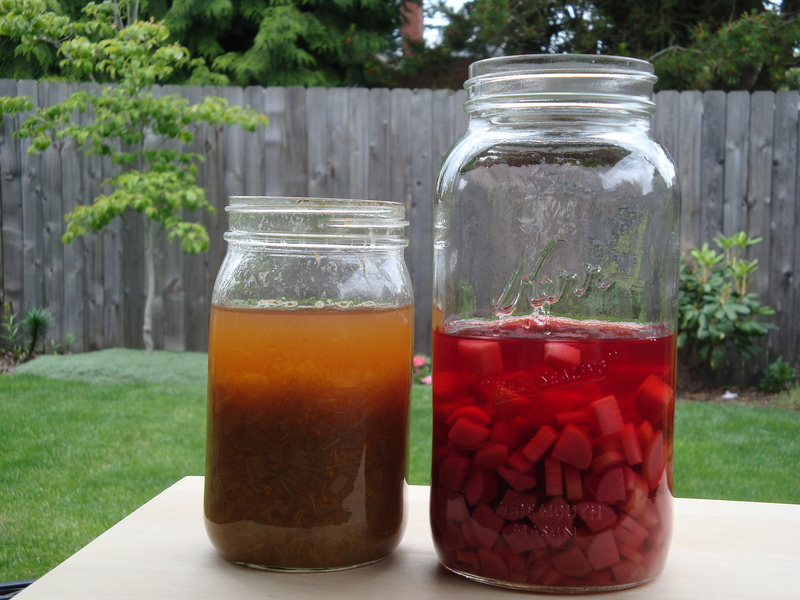 i luv making rhubarb syrup and using that in making drinks. i think the last one i concocted had the rhubarb syrup, some pisco, rum, and i think brandy. I suffer from produce envy, too– and now from cocktail envy! I too, get produce envy! This. Looks. Amazing. Thanks! They did turn out very nice, both in color and flavor. Thank you, Amy! I actually got these bottles at a local home brew store in Portland, OR called Homebrew Exchange. They sell some items online, but I’m not sure if they sell the bottles. Are the any home brew or container store near you? Canning supply stores are usually very good as well. Specialty Bottle has a great selection, but I don’t think they carry these. Hi Laura, the c. stands for one “cup”, which is 8 fluid ounces, or 240 ml. You can use about 1/4 of a litre. Where can you store the gin mix for a month? The fridge? Or elsewhere? Hi there – I am from the UK and am not sure what a TB. My thoughts range from a tiny bit to a tankard – BIG!!! Just bottled my first rhubarb gin- gorgeous! Can’t wait for next years crop of rhubarb fresh from the garden. But what do I make with the very tasty rhubarb that’s left? How about adding the boozy rhubarb to some berries and making jam or pancake topping? Hello from England. I’m lucky to live in the county of Yorkshire and within the area known as the Rhubarb Triangle, where we grow the best rhubarb in the country. Sounds strange I know , but it is famous over here.Hope you’ve heard of it. Just trying your recipe for Rhubarb Gin. Will be back in touch in a month to update you and hopefully raise a glass or two.